Soldiers of the 330th Infantry Regiment attended the All Army Small Arms Championships held by the Army Marksmanship Unit at Fort Benning, Georgia on February 1-9. The team consisted of Team Captain and firing member Lt. Col. David F. Schultz (Commander, 3/330th IN REGT, 4th BDE), Cmd. Sgt. Maj. Steven J. Slee (3/330th IN REGT, 4th BDE), Staff Sgt. Richard Willis (1/330th IN REGT, 4th BDE), and Staff Sgt. Jonathan Duthler (D Co., 3/330th IN REGT, 4th BDE). SSG Duthler’s second place finish among Drill Sergeants is worth mentioning as this event was his first marksmanship competition. “This is my first crack at competitive shooting. It’s very different when the stakes are high and you are competing against the best shooters in the Army,” he said. As a team, the 95th Division was first place in the Infantry Team Match and Excellence In Competition Rifle Team Match, and finished third place overall in the All Army Service Rifle Team Champions. In addition to leading this team for the 95th Division, Lt. Col. Schultz and Cmd. Sgt. Maj. Slee are also the OIC and NCOIC of the US Army Reserve Service Pistol Team. The 330th Infantry Regiment, 95th Division Team. 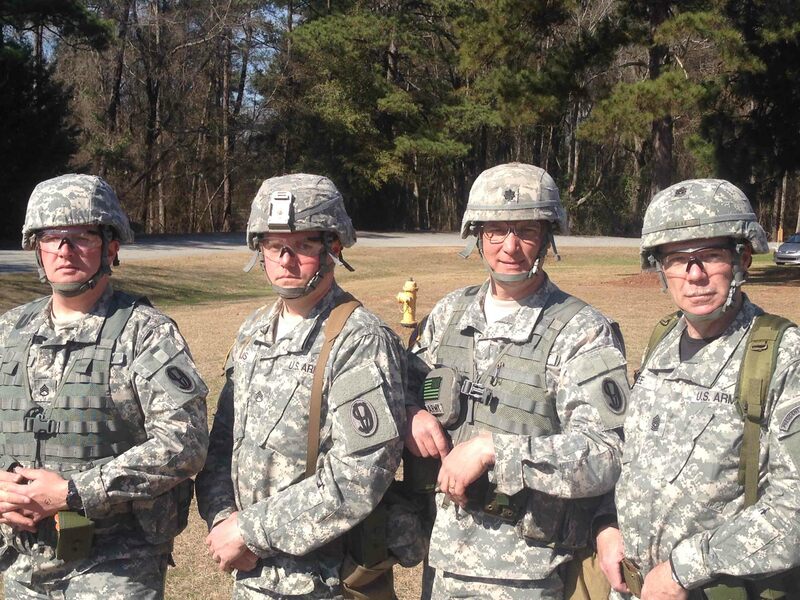 From left, SSG Jonathan Duthler, SSG Richard Willis, LTC David F. Schultz, and CSM Steven J. Slee at the All Army Small Arms Competition, Fort Benning, February 1-9.